The MHC-encoded MHC class I-related chains A (MICA) glycoproteins are known to enhance the functions of NK and T cells by ligating the stimulating receptor NKG2D and appear to play an important role in host defense. Human CMV (HCMV) evades the immune response in many different ways, but has not previously been found to down-regulate MICA. We have found that a common form of MICA, which has a nucleotide insertion in exon 5 corresponding to the transmembrane region and no cytoplasmic tail, was increased on the surface of fibroblasts HFS-13 compared with the mock-infected sample of the same cells that had been cultured to confluence. However, an astrocytoma cell line, U373, which has a full-length variant of MICA, showed that the expression of MICA was decreased after HCMV infection. Retroviral transduction of different MICA alleles into fibroblasts HFF-D, which express no MICA of their own, established that full-length MICA was down-regulated by HCMV, and the truncated form was not. Fibroblasts with decreased MICA due to HCMV infection were found to be protected from NK cell killing, whereas in the presence of the truncated form of MICA, the virus-infected cells were destroyed. Thus, the truncated form of MICA, which is the most common, has a mutation that allows it to persist on the surface and hinder efforts of the virus to evade the immune response. The immune response against human CMV (HCMV)3 is modified by a variety of strategies, allowing this virus to persist as an asymptomatic infection in most immunocompetent individuals. A prominent evasion mechanism used by HCMV is the down-modulation of MHC Ags on the surface of the infected cells (1, 2). For example, the classical HLA-A and HLA-B Ags are down-regulated by the unique short viral proteins US2, US3, US6, and US11, causing an impairment of the presentation of viral Ags to CD8+ host T cells (3). Other evasion mechanisms recently uncovered appear to involve the ligands of NKG2D (4). In the early stages of infection in vivo, NK cells are mobilized. These cells are activated by the ligands of the NKG2D receptor (5), which in humans include the MHC class I-related chains A and B (MICA and MICB) and the UL16-binding proteins ULBP1, ULBP2, and ULBP3 (6). It has recently been shown that MICB, ULBP1, and ULBP2 are selectively retained in the endoplasmic reticulum by the HCMV protein UL16 (7). The products of the MIC genes are structurally similar to the HLA class I Ags, including three extracellular domains (α-1, α-2, and α-3), a transmembrane (TM) region, and a cytoplasmic tail, but they are not associated with β2-microglobulin (8). They have a promoter that resembles that of heat shock proteins, and they appear to be produced in response to stress (9). The expression of MICA is increased in tumors and in response to viral or bacterial infections (10). Among the 55 known MICA alleles, one allele, termed MICA*008, is distinct from the other forms because it has an insertion of a guanine at position 952 in the TM region, resulting in the expression of a MICA protein with a truncated TM region and no cytoplasmic tail (11, 12, 13, 14). It is interesting that this mutant MICA with shortened intracellular elements is the most common allele in most populations studied (15, 16). In the present experiments we measured the surface expression of MICA by flow cytometry and total cellular expression by Western blot using mAbs specific for MICA (17, 18). Our initial results with fibroblasts were similar to those published by others (19, 20, 21), suggesting that the expression of surface MICA was maintained or even increased after HCMV infection. However, in the astrocytoma cell line U373, MICA was down-modulated after infection with HCMV. Examination of several different isolates of human fibroblasts and experiments using retroviral transduction of MICA genes and site-directed mutagenesis led to the conclusion that the unique structure of MICA*008 explained the observations. Our results showed that HCMV did not down-modulate MICA*008, whereas other, full-length alleles of MICA were eliminated from the cell surface after infection with HCMV. It was of interest to determine the effect of modulation of surface MICA by HCMV on susceptibility to killing by NK cells and whether, despite the extensive loss of the intracytoplasmic region, the variant allele was functionally active for costimulation of NK cell killing. If so, the high prevalence of this mutant allele could represent a host response to counter HCMV evasion of host defenses. Human dermal fibroblasts were isolated from samples of foreskin by treatment with dispase. They were used between 15 and 20 passages. U373 astrocytoma cells were obtained from American Type Culture Collection. All cells were cultured in DMEM supplemented with 2 mM l-glutamine, sodium pyruvate, nonessential amino acids, 100 U/ml penicillin, 100 μg/ml streptomycin and 10% FBS. Cultures were maintained at 37°C in a humid atmosphere containing 5% CO2. The NK cell line NKL (provided by M. J. Robertson, Indiana University School of Medicine, Indianapolis, IN) was cultured in RPMI 1640 medium with 15% FCS and 10 ng/ml IL-2 (R&D Systems). All virus infections were performed as previously described (22) with HCMV strains AD169, Towne, Towne ΔUS1–11 (23), AD169 ΔUL1–11, or ΔUL11–20 (details about the construction of ΔUL1–11 and ΔUL11–20 are available upon request). Virus stocks were added to a calculated multiplicity of infection of 5 PFU/cell in fibroblasts and 10 PFU/cell in U373 cells. The virus inoculum was removed after 1.5 h. For mock infection, the cells were exposed to mock-infecting fluids containing no virus particles for 1.5 h. After this, the infecting or mock-infecting fluids were replaced with warm DMEM containing 10% FBS. For infection of subconfluent cultures, 3.8 × 105 cells were seeded in 10-cm culture dishes 24 h before addition of virus, resulting in mock-infected fibroblasts that were not confluent after 96 h of culture. The hybridoma cells for the Ab w6/32 were obtained from American Type Culture Collection. mAbs specific for MICA, including the monomorphic Ab 6B3 (recognizing MICA native protein), the polymorphic Ab 3.2H3 (which does not react with MICA*001, but recognizes all other MICA native and denatured alleles tested), and 1.7AD (which reacts with denatured MICA protein), were produced by us as previously described (17, 18). Isotype-matched, purified normal mouse IgG and anti-actin mAb (Santa Cruz Biotechnology) were used at the appropriate concentrations as a negative control in flow cytometry and as an internal positive control in Western blot. At various times after infection, U373 cells or fibroblasts were detached by trypsinization and washed in PBS containing 1% sodium azide. Abs at the appropriate concentrations were added to 105 cells for 45 min, washed twice, and stained with PE-Cy5.5 or Cy5-conjugated F(ab′)2 of goat anti-mouse IgG (PE-Cy5.5 (Caltag Laboratories) and Cy5 (Jackson ImmunoResearch Laboratories)). After fixation with 2% paraformaldehyde, each sample was analyzed in a FACSCalibur flow cytometer (BD Biosciences). PE-Cy5.5 was measured with FL3, and GFP, when present, was detected with the FL1 detector using the first laser. Cy5 (488 nm), was measured with the FL4 detector using the second laser (633 nm). MICA proteins were detected by Western blot in cell lysates. Cells were lysed in lysis buffer (150 mM NaCl, 50 mM Tris-HCl (pH 7.4), 5 mM EDTA, 1% CHAPS, and 0.5% SDS) with protease inhibitor mixture (Roche). Cell lysates were immediately placed in boiling water for 10 min. SDS-PAGE under reducing conditions and Western blot were performed as previously described (18). Briefly, blocked nitrocellulose membranes were incubated with anti-MICA mAb 1.7AD or anti-actin mAb (Santa Cruz Biotechnology) for 1 h at room temperature. After washing, membranes were incubated with peroxidase-conjugated goat anti-mouse IgG (Bio-Rad), and bound Abs were developed by chemiluminescent detection with the ECL Western blotting detection reagent (Amersham Biosciences). Total RNA was extracted from 4 × 105 cells using an RNA kit (RNeasy kit; Qiagen) according to the manufacturer’s recommendations. After quantification of total RNA using OD at 260 nm (OD260) and 280 nm (OD280), 1.6 μg of RNA was heated at 70°C for 2 min immediately before first-strand cDNA being generated using Moloney murine leukemia virus-based reverse transcriptase with oligo(dT) primers (Advantage RT-PCR kit; BD Biosciences). The cDNA was stored at −80°C until analysis. All samples being compared underwent real-time PCR together. For the PCR step, reaction volumes of 20 μl contained SYBR Green 1 buffer (Applied Biosystems), and MICA-specific primers (5′-3′; forward, TGCCCCCCATGGTGAAT; reverse, AGAGGGCACAGGGTGAGTGC) were used, which amplified a band of 278 bp. Samples were run in triplicate, and real-time PCR was run for one cycle (95°C, 10 min), followed immediately by 50 cycles (95°C 10 s, 67°C 50 s), and fluorescence was measured with an automated fluorometer (ABI PRISM 7700 Sequence Detection System; Applied Biosystems) after each of the repetitive cycles. Relative quantitation of target RNA was measured using the threshold cycle value from a standard curve with a serially diluted reference cDNA. cDNAs were synthesized from 5 μg of total RNA extracted from the U373 cell line with MICA*001 and from different human fibroblasts with MICA*002, MICA*004, MICA*008, and MICA*027. Double-stranded MICA cDNA was amplified by PCR using primers MICA_LD-EcoRI (5′-3′; ACTATCTACGAATTCGCCATGGGGCTGGGCCCG GTC) and MICA_CY_BamHI (3′-5′; CTGGCTCCACTGAGGGCGCCTAGGATCC TAGACTCTA). The PCR products were cloned into the retroviral vector pLXSN (BD Clontech) with the original start codon and stop codon of MICA. To produce a modified MICA*001 with a truncated cytoplasmic tail, we performed site-directed mutagenesis to insert a guanine in position 952 into the pLXSN-MICA*001 construct. This mutant was called MICA-01952. Native MICA alleles and the MICA-01952 mutant construct were confirmed by sequencing. MICA-expressing retrovirus was generated according to the manufacturer’s protocol (BD Clontech) and used to infect HFF-D cells. Fibroblasts HFF-D were derived from a donor homozygous for MICA*010, an allele that has been shown not to be expressed (24). The populations of MICA-expressing fibroblasts were selected with 500 μg/ml G418 and were at least 94% positive for MICA by flow cytometry with mAb 6B3. Cytotoxicity was analyzed in a 4-h 51Cr release assay. Target cells were labeled with 100 μCi of 51Cr (Amersham Biosciences) for 1 h at 37°C and washed. Medium was added, and cells were incubated at 37°C for 1 h and washed three times. Effector cells were added to target cells and incubated for 4 h at 37°C. Spontaneous release of target cells alone was <15% of the maximum release attained from target cells lysed in 1% Triton X-100. The percent lysis was calculated as follows: (experimental release − spontaneous release)/(maximum release − spontaneous release) × 100. Experiments were performed in triplicate. Human skin fibroblasts HFS-13 were infected with HCMV AD169, stained with the MICA-specific mAb 6B3 and with w6/32, specific for HLA, and evaluated by flow cytometry at 0, 24, 48, and 72 h after infection (Fig. 1⇓). As expected, HLA staining decreased over time and was clearly shifted to the left at 72 h. MICA surface expression was increased at 24, 48, and at 72 h compared with the 0 h control, which had reached confluence. These results were similar to those described by other investigators (19, 20, 21). To study total MICA, lysates of these cells obtained 72 h after HCMV AD169 infection were analyzed by Western blot (Fig. 2⇓A). The results showed that the total amount of MICA in fibroblasts HFS-13 was well maintained 72 h after HCMV infection. Effect of HCMV AD169 on MICA expression in the U373 cell line and in primary dermal fibroblasts. Flow cytometry with control mouse IgG (thin line), mAb 6B3, specific for MICA (dark profile), and anti-HLA class I, w6/32 (dark line), 0, 24, 48, and 72 h after infection. 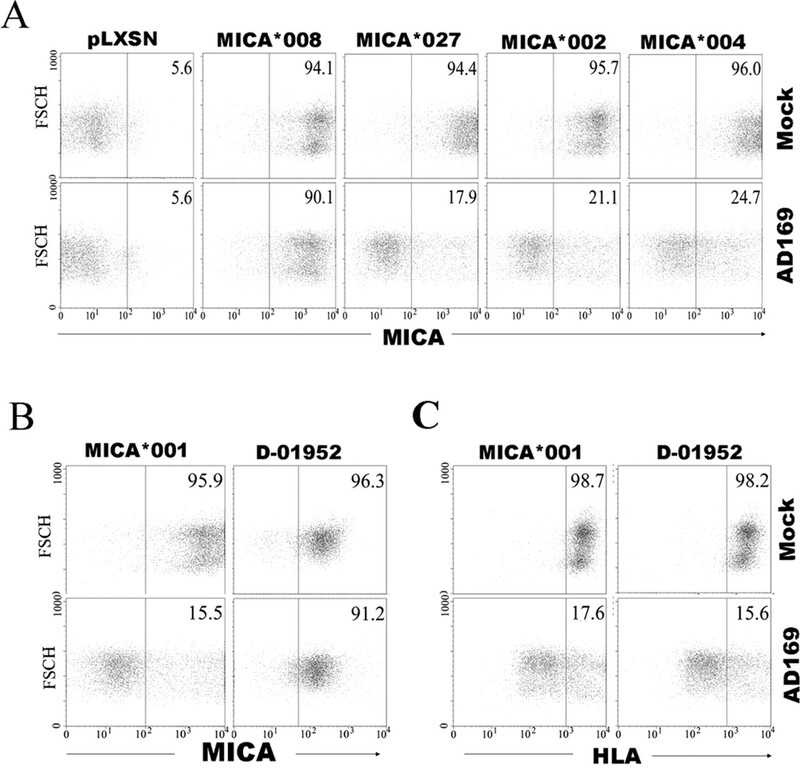 Effect of HCMV AD169 on total MICA and on MICA-specific mRNA. A, Cell lysates obtained 72 h after infection or mock treatment were electrophoresed in SDS-PAGE. MICA was immunoblotted with the mAb 1.7AD, and actin was shown as a marker of protein loading. B, MICA mRNA (top) and control G3PDH (bottom) were determined by real-time PCR 72 h after infection with HCMV AD169. Bars represent relative copy numbers, assigning a value of 1 to mRNA from mock-infected HFS-13. MICA-specific RNA was analyzed by real-time PCR in mock-infected fibroblasts and in fibroblasts infected with HCMV AD169 72 h after infection. As shown in Fig. 2⇑B, MICA-specific RNA was increased to almost twice the amount present in mock-infected cells. U373 cells were infected with HCMV AD169 and analyzed by flow cytometry with mAbs specific for MICA and HLA (Fig. 1⇑). Staining for both Ags decreased rapidly on the surface of U373 cells. After 72 h, surface MICA expression had decreased almost to the level of the negative control (Fig. 1⇑). Lysates of U373 cells examined 72 h after infection with HCMV AD169 showed very little MICA remained (Fig. 2⇑A). These results indicated that MICA was not decreased on the surface of U373 cells due to retention in the cytoplasm and suggested that in these cells MICA was destroyed and no longer detectable with the MICA-specific mAb 1.7 AD used in the Western blot experiments. MICA-specific RNA, analyzed by real-time PCR was not decreased in the astrocytoma cells after HCMV AD169, compared with the mock-infected controls (Fig. 2⇑B). From these results it appeared that the reduction in surface and intracellular MICA after HCMV infection of U373 cells was not due to a decrease in synthesis, but probably reflected an effect of HCMV on the MICA protein. Two MICA heterozygous fibroblast isolates were used in these experiments. Fibroblast HFF-new was typed as MICA*008 and MICA*002, and fibroblast HFF-F was found to have MICA*0027 and MICA*002. Because fibroblast HFS-13, used in a previous experiment, was MICA*008 homozygous, HFF-new shared with it the MICA*008 allele. MICA*008 is known to have a frameshift mutation in the TM region, resulting in a truncated TM region and absence of the cytoplasmic tail. MICA*027 is identical in the external domains to MICA*008 and does not have the TM region mutation; therefore, it has a full-length cytoplasmic tail. To determine whether the structure of MICA can influence the behavior of these molecules in cells infected by HCMV, the results obtained with fibroblast HFF-new were compared with those with HFF-F (Fig. 3⇓). Flow cytometry was performed 72 h after infection with HCMV AD169 and compared with the results for mock-infected cells maintained at subconfluence (as described in Materials and Methods). Staining with w6/32 showed that HLA class I Ags were clearly decreased on the surface of AD169-infected cells compared with mock controls in both fibroblast isolates. Staining was also performed with two mAbs, 3.2H2 and 6B3, both specific for MICA (Fig. 3⇓). In the case of fibroblast HFF-new (MICA*008 and MICA*002), MICA expression on the surface was only slightly decreased compared with that in mock-infected controls. In fibroblasts HFF-F (MICA*027 and MICA*002), in contrast, surface MICA expression was definitely decreased in cells infected with HCMV compared with mock controls. Because structurally the only difference between the MICA of the two fibroblast lines was the truncated TM and cytoplasmic elements in HFF-new, it appeared likely that the effect of HCMV infection on MICA expression depended on the presence of a complete MICA molecule. When MICA was truncated in the TM region, as in MICA*008, expression was unchanged, as in HFS-13 or HFF-new. However, in cells with full-length MICA, such as the astrocytoma cell line U373 or the fibroblast line FFF-F, MICA appeared to be down-regulated after HCMV infection. Effect of HCMV infection on MICA expression in heterozygous fibroblasts. Flow cytometry with fibroblasts HFF-F (MICA*027 and MICA*002) and fibroblast HFF-new (MICA*008 and MICA*002) 72 h after mock treatment or infection with HCMV AD169 at 5 PFU/cell. The donor of fibroblasts HFF-D was homozygous for MICA*010, an allele that has been shown (24) not to be expressed. Thus, these cells that did not express any MICA of their own were used to receive various MICA genes by retroviral transduction. Stable expression of MICA alleles was obtained in >90% of the transduced HFF-D cells, as shown in Fig. 4⇓. Surface MICA staining with Ab 6B3 showed that in the case of the truncated MICA allele (MICA*008; Fig. 4⇓A) 72 h after infection with HCMV AD169, there was little difference (90.1%) compared with mock-infected controls (94.1%). MICA alleles with a truncated TM/cytoplasmic tail region are resistant to down-regulation by HCMV, others are down-regulated. A, Fibroblasts HFF-D with the retroviral vector only (pLXSN) were used as the negative control. The percentage of cells staining for MICA with the mAb 6B3 is indicated for each assay by numbers in the top right of each graph. B, HFF-D fibroblasts were transduced with wild-type MICA*001 or with D-01952, a mutant with a truncated TM region created from MICA*001. Staining was performed 72 h after mock infection or infection with AD169. C, HLA class I Ags were stained with the mAb w6/32. HFF-D fibroblasts were transduced with the mutant MICA allele D-01952 or wild-type MICA*008. However, the cells with full-length MICA alleles tested in this experiment showed a decrease in surface MICA expression (Fig. 4⇑A) from mock controls of 94.4, 95.7, and 96.0% to 17.9, 21.1, and 24.7%, respectively. In all these cells HLA class I was down-regulated after HCMV infection (data not shown). Cell lysates from these experiments were also tested by Western blot to detect total MICA protein levels. The results shown in Fig. 6⇓A demonstrate abundant expression of a 73-kDa MICA glycoprotein in cells expressing MICA*001, *002, *004, or *027 after mock infection. However, after HCMV infection for 72 h, MICA expression was dramatically reduced (Fig. 6⇓A). Only in cells expressing the MICA*008 allele, which encodes for a 62-kDa glycoprotein (due to the truncated TM and absent cytoplasmic tail regions), was MICA retained in the cells at high levels after infection (Fig. 6⇓A). These results indicated that the decrease in surface expression of MICA by HCMV was not due to intracellular retention, but appeared to involve rapid degradation of MICA. To further analyze this phenomenon, site-directed mutagenesis was performed to insert a guanine at position 952 of a full-length MICA allele. The insertion resulted in the expression of a MICA protein that was truncated in the TM region at the identical position where the natural MICA*008 protein is truncated. The nucleotide structure was confirmed by sequencing, and this construct, called D-01952, was inserted into fibroblasts HFF-D. After retroviral transduction, 96.3% of the cells expressed surface MICA, and this form of MICA remained almost unchanged (91.2%) 72 h after infection with HCMV AD169. In the same experiment, the wild-type, full-length MICA was present in 95.9% of the control cells and decreased to 15.5% of the fibroblasts after infection with HCMV (Fig. 4⇑B). The same cells were also analyzed by flow cytometry with w6/32 for expression of HLA class I (Fig. 4⇑C). The expression of HLA decreased in both fibroblasts with wild-type full-length MICA and those transduced with the truncated mutant D-01952 (Fig. 4⇑C). The corresponding values were 98.7 and 98.2% in the mock-infected controls and 17.6 and 15.6% in the HCMV-infected cells. MICA has been shown to enhance killing by NK cells by engaging the activating receptor NKG2D (4). We performed experiments to determine the effect of modulation of expression of MICA by HCMV on NK cell cytotoxicity. Targets were HFF-D fibroblasts transduced with a retrovirus expressing either the MICA*027 or MICA*008 allele. Cells with only the retroviral vector (pLXSN in Fig. 5⇓A) were used as controls. The human NK cell line NKL (25) was used as the effector cells in experiments performed 72 h after HCMV infection of target cells. Fig. 5⇓A shows that after infection with HCMV, MICA*027 surface expression was abolished, whereas surface staining for MICA*008 was only slightly decreased (Fig. 5⇓A). In parallel experiments, NK cell killing of fibroblasts transduced with the MICA*008 allele, which was not modulated by HCMV, was maintained after HCMV infection. In contrast, cells transduced with the MICA*027 allele, which was down-regulated, became resistant to NK cell killing 72 h after infection with HCMV (Fig. 5⇓B). Reduced MICA expression after HCMV infection impairs NK cell cytotoxicity. A, Flow cytometry with the mAb 3.2H3, specific for MICA, using fibroblasts HFF-D with pLXSN retroviral vector as a control (pLXSN) or transduced with either MICA*027 or MICA*008. Ig isotope controls (dotted line), mock-infected cells (thin continuous line), and HCMV AD169 strain-infected cells (heavy line) are shown. Staining was performed 72 h after infection with AD169 at a multiplicity of infection of 5 PFU/cell. B, Cytotoxicity experiments with the NK cell line NKL. Each panel shows results with mock-infected and AD169-infected cells. The target cells were the same transfectant fibroblasts as in A. It has been shown that the HCMV protein UL16 interacts with various ligands of NKG2D, including MICB, but not with MICA (7, 26). We have used viral mutants of HCMV that lack either gene UL1–11 or UL11–20 and express the GFP to determine whether one of these HCMV genes is responsible for the down-regulation of MICA expression. After infection of HFF-D cells expressing either the MICA*027 or MICA*008 allele with wild-type virus or these viral mutants, the level of total MICA protein expression was examined by Western blot. As shown in Fig. 6⇓B, the effect of these mutant viruses on MICA expression did not change compared with wild-type HCMV; MICA*027 was down-regulated despite the absence of genes UL1–20, and MICA*008 was resistant to down-regulation. These results indicated that unlike MICB, none of these UL genes, including UL16, is responsible for the down-regulation of MICA expression. Effects of HCMV and HCMV mutant strains on MICA expression. A, Western blots using the 1.7AD mAb specific for MICA, 72 h after mock or AD169 infection. Full-length MICA was seen as a band of 73 kDa; MICA*008, with a truncated TM region and cytoplasmic tail, gave a band of ∼62 kDa. B, HCMV deletion mutants lacking UL1–11 (ΔUL1–11), UL11–20 (ΔUL11–20), or the control virus AD169 (left) and HCMV deletion mutants lacking US1–11 or the control virus Towne (right) were used to infect HFF-D fibroblasts transduced with MICA*027 or MICA*008. C, Flow cytometry of HFF-D fibroblasts transduced with MICA*027 or MICA*008, mock infected or infected with the mutant HCMV ΔUS1–11 fused with GFP. MICA was stained with the mAb 6B3, and HLA class I Ags were detected with w6/32. The HCMV protein US11 down-regulates the expression of MHC class I Ags and has been shown to require the cytoplasmic tail region of the MHC class I Ags for their degradation (27, 28). In the present experiments we used a mutant virus lacking HCMV genes US1–US11 (23), thus lacking all four unique short region proteins, US2, US3, US6, and US11, each of which is known to cause down-regulation of MHC class I molecules (29). 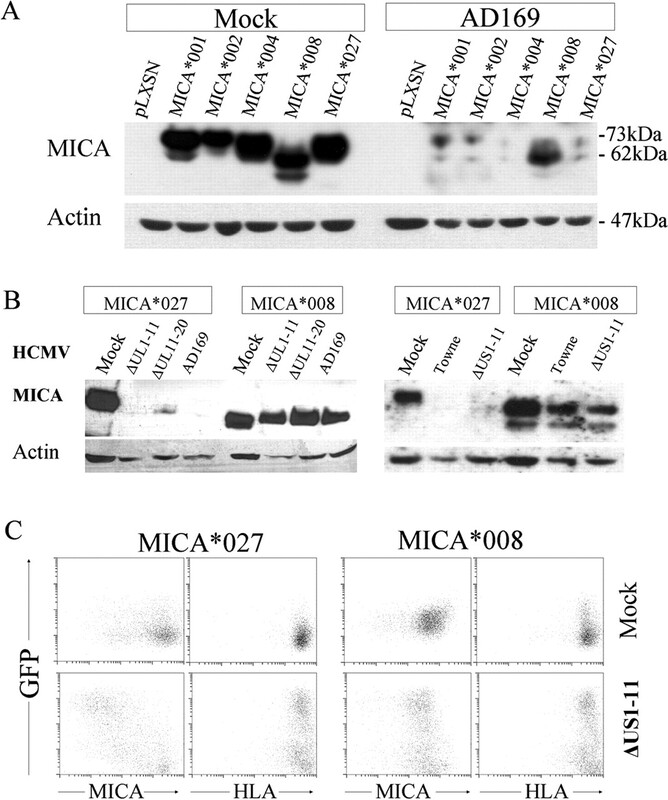 We have found that this mutant virus effectively down-regulated intracellular and surface expression of MICA in cells expressing the MICA*027 allele, but not in cells expressing the MICA*008 allele (Fig. 6⇑, B and C). As expected, the ΔUS1–11 mutant did not inhibit the expression of MHC class I Ags in either MICA*008- or MICA*027-expressing cells (Fig. 6⇑C). Thus, US11 (as well as US1–US10) do not appear to be responsible for the HCMV modulation of susceptible MICA alleles. The costimulatory pathway of NKG2D and its ligands is increasingly considered an important element in both innate and adaptive immune responses (30, 31, 32). NKG2D is expressed on NK cells as well as αβ and γδ T cells (5), and the ligands have been shown to be up-regulated in various forms of stress, including neoplastic transformation and bacterial or viral infections (6). HCMV is known to have developed many different strategies to evade the immune response, including down-regulation of MHC Ags (3), and recently, it has been shown that it can also down-regulate the surface expression of several NKG2D ligands. The unique long region glycoprotein 16 (UL16) of HCMV was recently shown to bind and retain inside the cell the NKG2D ligands MICB, ULBP1, and ULBP2, but not MICA or ULBP3 (7). In some previous experiments an increase in the surface expression of MICA was observed after HCMV infection compared with mock-infected control cells (19). We have found that control fibroblasts actively growing to repair the monolayer, express fairly high levels of surface MICA, perhaps due to stress, and when the cultures become confluent, the expression of MICA is reduced.4 When the same fibroblasts were infected with HCMV, they appeared to be similarly stressed and express surface MICA. When these infected cultures were compared with the mock controls that had reached confluence and were undergoing contact inhibition, the difference in MICA expression was very striking. To avoid this artifact, our fibroblast cultures were seeded at a lower concentration, so that in the controls’ confluence did not occur during the duration of the experiments. With this precaution, surface staining for MICA in HCMV-infected fibroblasts HFS-13 and mock-infected controls was of similar intensity after 72 h of culture. These results were similar to those published by others (19, 20, 21). However, when we infected the astrocytoma cell line U373 with HCMV, the results were different. In U373, MICA was down-regulated after HCMV infection. Subsequent experiments demonstrated that the differential effect of HCMV on MICA expression between the astrocytoma cell line U373 and fibroblast HFS-13 was due to a difference in the structure of the MICA alleles in these cells. The fibroblasts HFS-13 expressed MICA*008, which has a polymorphism in the TM region that is truncated, and there was no cytoplasmic tail. MICA*008 was the most common allele in several populations. It was found in 67% of 103 North American Caucasians typed in our laboratory by PCR-sequence-specific oligonucleotide probes (16). The astrocytoma cell line U373 expressed MICA*001, a wild-type full-length allele. The experiments with MICA heterozygous fibroblasts indicated that the differences in the effect of HCMV on the expression of MICA were not due to different properties of the host cells used. Fibroblasts with MICA*008, with a truncated cytoplasmic tail, were not down-modulated by HCMV, whereas fibroblasts with MICA*027, which is structurally identical with MICA*008, but without the TM region mutation, had their MICA down-regulated by the virus. Definitive evidence for a role of the TM/intracytoplasmic regions of MICA in down-regulation by HCMV was provided by experiments in which MICA variants were expressed in fibroblasts HFF-D using retroviral transduction. In addition to the naturally occurring mutation resulting in a short intracytoplasmic segment in MICA*008, we also produced and tested a similar variant produced by site-directed mutagenesis. In every experiment HCMV infection down-modulated the full-length alleles of MICA, whereas with the shortened mutants expression remained high. Such cells that continued to express high levels of surface MICA were susceptible to killing by NK cells. In contrast, fibroblasts transduced to express a structurally identical allele, but with intact intracellular components (MICA*027), became resistant to NK cell killing after infection by HCMV (Fig. 5⇑). In vivo, it is possible that individuals with the shortened variant of MICA would eliminate the virus when their infected cells are killed by NK cells stimulated by interaction of NKG2D with MICA. Our experiments with mutant strains of HCMV demonstrated that the viral unique short proteins (US2, US3, US6, and US11), which have been shown to down-regulate HLA class I expression, are not responsible for modulation of the expression of MICA. Additional experiments with another HCMV mutant lacking UL1–UL20 indicate that none of these genes is involved in controlling the expression of MICA. UL16 has previously been shown to capture and retain MICB as well as ULBP1 and ULBP2 (7), and our results are in agreement that UL16 does not appear to be responsible for modulating MICA (33). Our results provide some information about the likely mechanism by which the expression of MICA is down-modulated after HCMV infection. The Western blot results indicate that MICA was not retained inside the cells. It most likely was degraded and became undetectable with the mAbs used for the Western blots. The real-time PCR results suggested that MICA-specific mRNA was being produced at a normal or slightly increased rate in cells in which cell surface MICA was decreased by the virus. 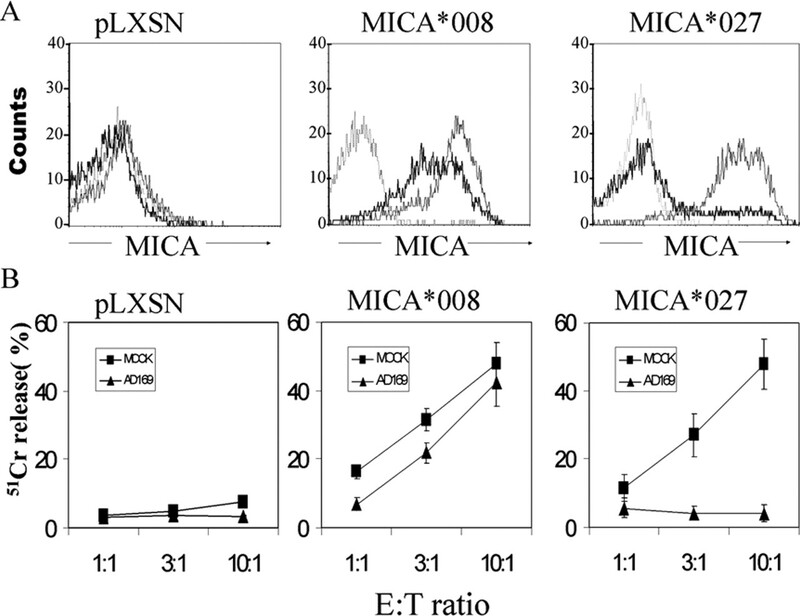 Taken together, these observations suggest that modulation of expression of MICA was due to an effect targeting the MICA proteins and not to a decrease in synthesis. It has been reported that MICA is down-regulated in human tumors and tumor cell lines by proteolytic shedding from the cell surface (34, 35) with release of a soluble form of MICA (34) that may bind to NKG2D and inhibit T cell activation (35). Because this phenomenon was also observed in the HeLa cell line, which is known to be MICA*008 homozygous, it seems unlikely that similar cell surface shedding would explain the down-regulation of MICA after infection with HCMV, because the expression of MICA*008 was not down-regulated by the virus in our experiments. In recent experiments Suemizu et al. (36) have shown that in polarized intestinal cells most MICA molecules are sorted to the basolateral surface, whereas MICA*008 is transported instead to the apical region of the surface of such cells (36). The results suggest that MICA*008 may be transported by a different pathway than that of the full-length alleles. Although this is not known for other cells, it is possible that this form of MICA, with a truncated TM region and no cytoplasmic tail, may be expressed at normal levels after HCMV infection because it is directed through an alternative and possibly protected transport route. It is intriguing to speculate whether the interaction with pathogens such as HCMV during evolution may have played a role in the development of the polymorphism of MICA. MICA*008 appears to be stably expressed on the surface of cells; our results show that it is functionally active in enhancing killing by the NKL cell line, and it is known to be the most frequent allele in many populations (16, 37). The results of our NK cytotoxicity experiments support the idea that this allele, which resists down-regulation, is functionally relevant and may aid in the elimination of virus-infected cells. The possibility that MICA*008 might confer resistance against HCMV infection through strong innate immunity may be testable experimentally and is currently being examined. We thank Dr. M. J. Robertson for kindly providing NKL, and Dr. N. S. Williams for help with the real-time PCR assay. We are grateful to Y. Tan, C. Giang, and Z. Wang for their technical support, and to B. A. Moyer for her excellent secretarial assistance. ↵1 Current address: Department of Microbiology, University of Minnesota, 1060 Mayo Building, MMC196, 420 Delaware Street SE, Minneapolis, MN 55455. ↵3 Abbreviations used in this paper: HCMV, human CMV; MICA, MHC class I-related chains A; MICB, MHC class I-related chains B; TM, transmembrane; ULBP, UL16-binding protein. ↵4 Y. Zou, F. Mirbaha, and P. Stastny. Contact inhibition causes strong down-regulation of expression of MICA and decreased NK cell killing of human fibroblasts. Submitted for publication. Loenen, W. A., C. A. Bruggeman, E. J. Wiertz. 2001. Immune evasion by human cytomegalovirus: lessons in immunology and cell biology. Semin. Immunol. 13:41. Tortorella, D., B. Gewurz, D. Schust, M. Furman, H. Ploegh. 2000. Down-regulation of MHC class I antigen presentation by HCMV; lessons for tumor immunology. Immunol. Invest. 29:97. Jones, T. R., L. K. Hanson, L. Sun, J. S. Slater, R. M. Stenberg, A. E. Campbell. 1995. Multiple independent loci within the human cytomegalovirus unique short region down-regulate expression of major histocompatibility complex class I heavy chains. J. Virol. 69:4830. Steinle, A., P. Li, D. L. Morris, V. Groh, L. L. Lanier, R. K. Strong, T. Spies. 2001. Interactions of human NKG2D with its ligands MICA, MICB, and homologs of the mouse RAE-1 protein family. Immunogenetics 53:279. Eleme, K., S. B. Taner, B. Onfelt, L. M. Collinson, F. E. McCann, N. J. Chalupny, D. Cosman, C. Hopkins, A. I. Magee, D. M. Davis. 2004. Cell surface organization of stress-inducible proteins ULBP and MICA that stimulate human NK cells and T cells via NKG2D. J. Exp. Med. 199:1005. Welte, S. A., C. Sinzger, S. Z. Lutz, H. Singh-Jasuja, K. L. Sampaio, U. Eknigk, H. G. Rammensee, A. Steinle. 2003. Selective intracellular retention of virally induced NKG2D ligands by the human cytomegalovirus UL16 glycoprotein. Eur. J. Immunol. 33:194. Li, P., S. T. Willie, S. Bauer, D. L. Morris, T. Spies, R. K. Strong. 1999. Crystal structure of the MHC class I homolog MIC-A, a γδ T cell ligand. Immunity 10:577. Tieng, V., C. Le Bouguenec, L. du Merle, P. Bertheau, P. Desreumaux, A. Janin, D. Charron, A. Toubert. 2002. Binding of Escherichia coli adhesin AfaE to CD55 triggers cell-surface expression of the MHC class I-related molecule MICA. Proc. Natl. Acad. Sci. USA 99:2977. Fodil, N., L. Laloux, V. Wanner, P. Pellet, G. Hauptmann, N. Mizuki, H. Inoko, T. Spies, I. Theodorou, S. Bahram. 1996. Allelic repertoire of the human MHC class I MICA gene. Immunogenetics 44:351. Gaudieri, S., C. Leelayuwat, D. C. Townend, J. Mullberg, D. Cosman, R. L. Dawkins. 1997. Allelic and interlocus comparison of the PERB11 multigene family in the MHC. Immunogenetics 45:209. Mizuki, N., M. Ota, M. Kimura, S. Ohno, H. Ando, Y. Katsuyama, M. Yamazaki, K. Watanabe, K. Goto, S. Nakamura, et al 1997. Triplet repeat polymorphism in the transmembrane region of the MICA gene: a strong association of six GCT repetitions with Behcet disease. Proc. Natl. Acad. Sci. USA 94:1298. Visser, C. J., M. G. Tilanus, Z. Tatari, A. W. van der Zwan, R. Bakker, E. H. Rozemuller, V. Schaeffer, R. Tamouza, D. Charron. 1999. Sequencing-based typing of MICA reveals 33 alleles: a study on linkage with classical HLA genes. Immunogenetics 49:561. Petersdorf, E. W., K. B. Shuler, G. M. Longton, T. Spies, J. A. Hansen. 1999. Population study of allelic diversity in the human MHC class I-related MIC-A gene. Immunogenetics 49:605. Zhang, Y., A. M. Lazaro, B. Lavingia, P. Stastny. 2001. Typing for all known MICA alleles by group-specific PCR and SSOP. Hum. Immunol. 62:620. Zou, Y., F. Mirbaha, A. Lazaro, Y. Zhang, B. Lavingia, P. Stastny. 2002. MICA is a target for complement-dependent cytotoxicity with mouse monoclonal antibodies and human alloantibodies. Hum. Immunol. 63:30. Zou, Y., P. Stastny. 2002. Alternatively spliced forms of MICA and MICB lacking exon 3 in a human cell line and evidence of presence of similar RNA in human peripheral blood mononuclear cells. Immunogenetics 54:671. Groh, V., R. Rhinehart, J. Randolph-Habecker, M. S. Topp, S. R. Riddell, T. Spies. 2001. Costimulation of CD8αβ T cells by NKG2D via engagement by MIC induced on virus-infected cells. Nat. Immunol. 2:255. Vales-Gomez, M., H. Browne, H. T. Reyburn. 2003. Expression of the UL16 glycoprotein of human cytomegalovirus protects the virus-infected cell from attack by natural killer cells. BMC Immunol. 4:4. Rolle, A., M. Mousavi-Jazi, M. Eriksson, J. Odeberg, C. Soderberg-Naucler, D. Cosman, K. Karre, C. Cerboni. 2003. Effects of human cytomegalovirus infection on ligands for the activating NKG2D receptor of NK cells: up-regulation of UL16-binding protein (ULBP)1 and ULBP2 is counteracted by the viral UL16 protein. J. Immunol. 171:902. Bresnahan, W. A., I. Boldogh, E. A. Thompson, T. Albrecht. 1996. Human cytomegalovirus inhibits cellular DNA synthesis and arrests productively infected cells in late G1. Virology 224:150. Marchini, A., H. Liu, H. Zhu. 2001. Human cytomegalovirus with IE-2 (UL122) deleted fails to express early lytic genes. J. Virol. 75:1870. Li, Z., V. Groh, R. K. Strong, T. Spies. 2000. A single amino acid substitution causes loss of expression of a MICA allele. Immunogenetics 51:246. Robertson, M. J., K. J. Cochran, C. Cameron, J. M. Le, R. Tantravahi, J. Ritz. 1996. Characterization of a cell line, NKL, derived from an aggressive human natural killer cell leukemia. Exp. Hematol. 24:406. Cosman, D., J. Mullberg, C. L. Sutherland, W. Chin, R. Armitage, W. Fanslow, M. Kubin, N. J. Chalupny. 2001. ULBPs, novel MHC class I-related molecules, bind to CMV glycoprotein UL16 and stimulate NK cytotoxicity through the NKG2D receptor. Immunity 14:123. Furman, M. H., H. L. Ploegh, D. Tortorella. 2002. Membrane-specific, host-derived factors are required for US2- and US11-mediated degradation of major histocompatibility complex class I molecules. J. Biol. Chem. 277:3258. Barel, M. T., N. Pizzato, D. van Leeuwen, P. L. Bouteiller, E. J. Wiertz, F. Lenfant, M. H. Furman, H. L. Ploegh, D. Tortorella. 2003. Amino acid composition of α1/α2 domains and cytoplasmic tail of MHC class I molecules determine their susceptibility to human cytomegalovirus US11-mediated down-regulation. Eur. J. Immunol. 33:1707. Park, B., H. Oh, S. Lee, Y. Song, J. Shin, Y. C. Sung, S. Y. Hwang, K. Ahn. 2002. The MHC class I homolog of human cytomegalovirus is resistant to down-regulation mediated by the unique short region protein (US)2, US3, US6, and US11 gene products. J. Immunol. 168:3464. Westwood, J. A., J. M. Kelly, J. E. Tanner, M. H. Kershaw, M. J. Smyth, Y. Hayakawa. 2004. Cutting edge: novel priming of tumor-specific immunity by NKG2D-triggered NK cell-mediated tumor rejection and Th1-independent CD4+ T cell pathway. J. Immunol. 172:757. Ogasawara, K., J. A. Hamerman, L. R. Ehrlich, H. Bour-Jordan, P. Santamaria, J. A. Bluestone, L. L. Lanier. 2004. NKG2D blockade prevents autoimmune diabetes in NOD mice. Immunity 20:757. Dunn, C., N. J. Chalupny, C. L. Sutherland, S. Dosch, P. V. Sivakumar, D. C. Johnson, D. Cosman. 2003. Human cytomegalovirus glycoprotein UL16 causes intracellular sequestration of NKG2D ligands, protecting against natural killer cell cytotoxicity. J. Exp. Med. 197:1427. Wu, J., N. J. Chalupny, T. J. Manley, S. R. Riddell, D. Cosman, T. Spies. 2003. Intracellular retention of the MHC class I-related chain B ligand of NKG2D by the human cytomegalovirus UL16 glycoprotein. J. Immunol. 170:4196. Salih, H. R., H. G. Rammensee, A. Steinle. 2002. Cutting edge: down-regulation of MICA on human tumors by proteolytic shedding. J. Immunol. 169:4098. Groh, V., J. Wu, C. Yee, T. Spies. 2002. Tumour-derived soluble MIC ligands impair expression of NKG2D and T-cell activation. Nature 419:734. Suemizu, H., M. Radosavljevic, M. Kimura, S. Sadahiro, S. Yoshimura, S. Bahram, H. Inoko. 2002. A basolateral sorting motif in the MICA cytoplasmic tail. Proc. Natl. Acad. Sci. USA 99:2971. Zhang, Y., M. Han, R. Vorhaben, C. Giang, B. Lavingia, P. Stastny. 2003. Study of MICA alleles in 201 African Americans by multiplexed single nucleotide extension (MSNE) typing. Hum. Immunol. 64:130.